Casualty documents the loss of life on all sides in the war in Iraq. The printed image is a photopolymer intaglio plate (9 x 10 inches) that is a layering of a photograph and a hatch-mark drawing representing those who have died in the conflict. I have made about 350 prints of this particular plate that have been stitched together, a memorial of the loss of life in Iraq currently estimated at anywhere between 100,000 and 400,000. 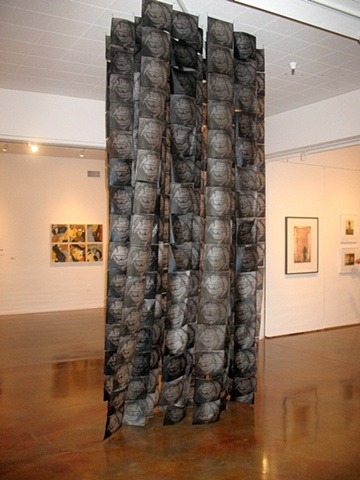 Casualty has been exhibited at Cabrillo College Gallery, Aptos CA; Works/San Jose, San Jose CA; and The Urban Institute for Contemporary Arts in Grand Rapids, MI.